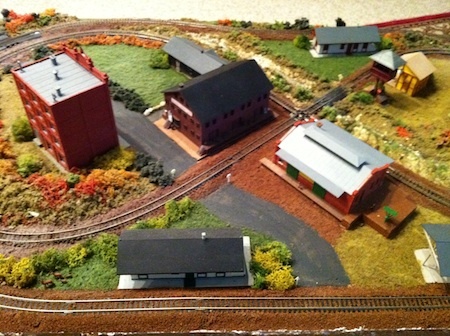 WELCOME to the 10th issue of BYMRr-Zine - a newsletter published by the author of the website Building Your Model Railroad, and devoted to providing breaking news and tips to model railroaders of all ages and all scales in a quick and easy-to-read format. Resources are always credited where appropriate. BTW, there are lots of photos of the layout on the bottom of that page. Don't miss them! Well we've actually been on Facebook for a while now, but we've just recently enhanced our involvement with the social networking site. We now have a "Like" button on every page of our site. The Like button at the top of each page says that you like the whole site. The Like button at the bottom of each page says that you like that particular page. Don't worry about remembering that. Just click on both of them as often as you like. The more "likes" we get, the more popular our site will be, and the more people will get to use all the free information and resources that are available there. In addition, at the bottom of each page is a Facebook comment box where you can enter whatever comment you might have about the page and it will show up on the BYMRR Facebook Wall. This doesn't replace our regular Comments Page. You will still be able to go there and send us a comment directly - or send us your own model railroad article, tip or experience, not to mention photos. And don't forget the Showcase Page where you can show off your projects. A nice article in N Scale Railroading, by Richard Thomason, called "Modeling a Southern Railway Greenville Woodchip Hopper", demonstrated on p.43 how to make hopper loads easily and realistically. Even though he was modeling in N scale, this technique would apply to any scale. Most of the time if we try to buy one of these "loads", it's never the right size when we get it home. I think this is one of those things where it's really better if we make our own. What you do is find a piece of rubber foam like the kind that comes with the packaging with a new locomotive. Measure the inside of the hopper where you want to place the load, and then, using sharp scissors, cut the rubber foam to fit. Remember that it should be deep enough to fill the bottom of the hopper, since you don't want the load to sink to the bottom. Make sure the top of the load is a little irregular to simulate mounds since that's how they usually appear in real life. Then paint the top of the load whatever color that matches what you want the car to be carrying. If the car is going to be carrying wood chips as it did in this article, you will want to paint the top tan. If it's going to carry coal, you would use black - or reddish brown for iron ore, or gray for gravel, etc. While the paint is still wet, sprinkle sawdust on the load to represent woodchips, or black coal dust for coal, or ballast for ore or gravel using the appropriate color. Now all your individual hoppers are unique, because every load is a little different depending on the little irregularities in how you cut the rubber foam. TrainPlayer Software has announced a new upgrade (4.0/ops) for its program featuring a new Ops package that contains new displays simulating freight operations. You can find it at www.trainplayer.com. It requires Windows. Won't run on a Mac unfortunately. There are lots of uses for a rotary tool in model railroading as shown in the article "Rotary Tools Are Useful for Many Model Railroad Jobs" in the November, 2011 issue of Model Railroader by Jim Hediger. One application that he didn't mention was its usefulness in fine-tuning track and turnouts to help prevent derailments. When you first glue or tack down track on a new layout, no matter how careful you are, invariably there will be problems in getting the trains to run smoothly over some of the rail-joints and turnouts. After you have run your train for its "maiden voyage" over a new piece of track, the next thing you will likely be doing is getting out the hand files (not the paper kind), and start working on those uneven rail-joints or smoothing over or sharpening some of the plastic corners on the turnout guard rails to keep the locomotives or cars from hanging up on them or hitting one of them too squarely and jumping track. I've found that I can make fairly short work of this process by using my cordless (Dremel in this case, but there are several others) rotary tool with a cutter disk. I like the cordless one because the cord on the corded tool always gets in the way and knocks over a tree or a building or something else. I can get down in the grooves with the cutter disk where the filing often needs to be done. I can't always do that with a regular hand file. The rotary tool is also great for making nice, clean, small, unobtrusive rail gaps in track that's already been nailed down. I think my next "Small Project" will either be another small 24"x48" layout using different techniques. Or maybe, even better, I think it would be really be fun getting out the old hollow core door (32" x 78") and setting up a new HO layout.